Glamourbrain: I Can't Go On. I'll Go On. 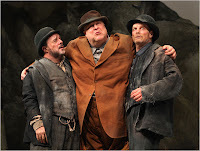 Last night, I was lucky enough to be at the opening night of the excellent new Roundabout Theatre production of Waiting for Godot. Ben Brantley's Times review says everything I could have said about it, though I found it more poignant than he did. It is, after all, and among many other things, a study of two bickering, entirely co-dependent couples. VLADIMIR: Now? . . . (Joyous.) There you are again . . . (Indifferent.) There we are again. . . (Gloomy.) There I am again. VLADIMIR: Ah no, Gogo, the truth is there are things that escape you that don't escape me, you must feel it yourself. ESTRAGON: I tell you I wasn't doing anything. VLADIMIR: Perhaps you weren't. But it's the way of doing it that counts, the way of doing it, if you want to go on living. ESTRAGON: I wasn't doing anything. VLADIMIR: Say you are, even if it's not true.